Amanda Levendowski ’14 was compelled to respond to a recent New York Times piece critical of law journals with a blog response of her own, which is reproduced here with her permission. This New York Times article bemoaning the “lackluster scholarship” of law journals (largely because the editors are students) ignores why law journals are valuable. Notably, the Times doesn’t mention that nearly every person quoted in the article–all men, by the way–participated in this “incompetent,” irrelevant, unhelpful, and biased system. These men likely would not have risen to their positions of prominence had it not been for their participation on a journal. Not only were these men on law journals, they were on the most prestigious journal at their respective institutions. Many of these men joined law journals for the reasons many students do: it’s expected and it opens doors. Law journal membership is often an unspoken prerequisite for prestigious scholarships, clerkships and professorships and the three frequently come hand-in-hand. Some have hired–or not hired–research assistants, summer associates or clerks based on journal membership. Even as these jurists, professors and practitioners criticize law journals, many received well-deserved opportunities because of their experience on law journals. We can argue about whether the scholarship in law journals is helpful to the legal practice. 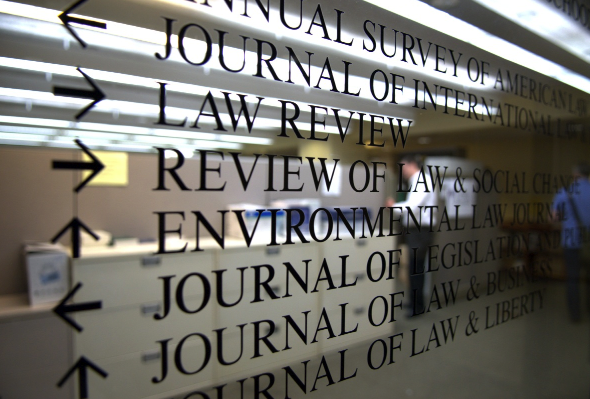 What’s beyond debate is that law students can benefit immensely from membership on a journal. There is a reason that journal membership is so often used as a metric of qualification. Journals are the best places to learn how to effectively write in a legal setting and how to efficiently edit legal work. It’s how we, as law students, build communities and friendships. We network with alumnae and peers, judges and practitioners. We produce a final product. We foster mentorships with advisors and professors. We work on tight, often high-pressure deadlines. We explore fascinating issues of law. We vastly improve our research, writing and editing skills. In short, it prepares us to be lawyers. Updated: Adam Liptak, author of the article, was also on a law journal. He was an editor of the Yale Law and Policy Review. This entry was written by Guest Blogger and posted on October 23, 2013. From time to time, guest bloggers contribute posts to provide unique perspectives on particular aspects of the student experience at NYU Law.